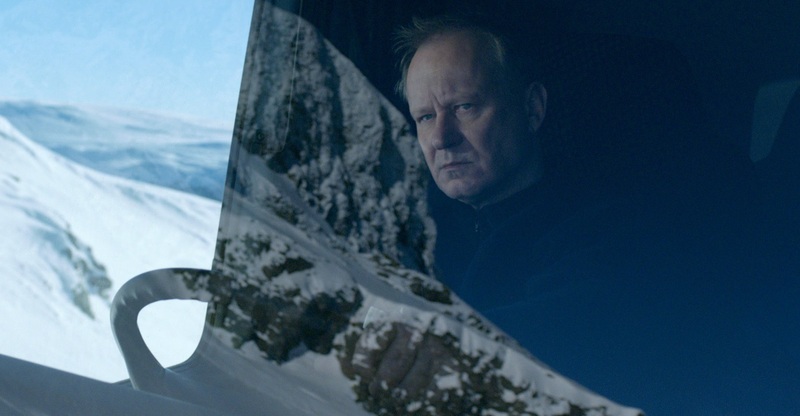 “In Order of Disappearance” is something to akin to a Norwegian “John Wick”, a little less arty, a little more earthy, evoked in the myriad ways that director Hans Petter Moland implements the Scandinavian landscape, from traditional wide shots of snowy mountains to a dead man slung from a road sign in a snow to two brothers arguing in front of a giant outdoor holiday decoration. The hero, the unfortunately named Nils Dickman (Stellan Skarsgård), is spurred by revenge too, a la John Wick, but his principal sartorial choice is a parka rather than well-tailored suit, his weapons of choice are his fists and snowplow and Skarsgård evokes not a dour cool but a weary, even droll, countenance. He’s a man of simplicity, which he addresses straight away as he is named his little town’s Citizen of the Year, explaining he prefers minding his own business. If everyone thought like that, someone says, we wouldn’t have democracy. And though “In Order of Disappearance”, despite a hilarious dialogue dalliance on the welfare, is not political, it is democratic, in its assortment of characters and its insistence on not simply making its star the star of the show. Nils’s warpath is triggered not by a dog but by the death of his son Ingvar who has inadvertently run afoul of some violent cocaine smugglers. In the immediate wake of this, “In Order of Disappearance” feints seriousness. But as Nils refuses to take for granted the official cause of death as overdose, and as he ventures out into the cold to become Dirty Harry of the Tundra, ambushing unsuspecting gangsters, killing them and hurling them over a waterfall, the film’s stoicism gradually morphs into deadpan, as the names of the deceased that pop up on the screen with an underlying cross become more and more comedic as the bodies keep piling up. It’s not so much that Moland is making fun of the dead as he is making fun of the absurd body counts in these sorts of movies. In defiance of mere faceless henchmen, Moland and his screenwriter Kim Fupz Aakeson provide most of the supporting players a modicum of actual character to play, and if not character to play then at least a few lines of sharp dialogue to recite. This is most apparent in the film’s principal villain, the one Nils is most desperately seeking to kill, The Count (Pål Sverre Valheim Hagen). He’s not exactly imposing, not in a traditional way, passing himself as quite cultured even though he doesn’t know the difference between Albanians and Serbians, and he’s as easy to laugh at as he is to be scared off, which is sort of where his scariness stems from, an immature impetuousness tied directly to taking over the business from his father. Not that he can’t be fierce, like in one frightful moment where he punches his wife Marit (Birgitte Hjort Sørensen). That’s something of a problem. The female characters here are not as thought through as the male characters, though Sørensen plays baked in disgust with her ex-husband pretty well. Nil’s wife disappears almost straight away, unable to come to terms with her son’s death and what her husband does about it. Then again, this is specifically a man’s movie, which is to say it’s a bunch of rash men who are, in a way, all stuck up their own arses, all hell bent on avenging this or that, which is perhaps why Nils’s wife exits stage left. She doesn’t need anything to do with all that macho posturing. Indeed, the conclusion fails to bring any sense of vengeance home. This is partly by design as Nils sort of blends into the ensemble, remaining off screen not for long stretches, per se, but stretches longer than we are normally conditioned to expect for the ostensible hero. All of this also means, however, that rather than truly picking up steam as it goes along, the movie slows down, indulging itself rather than building momentum. That’s not necessarily a bad thing, because the flights of fancies are often fun, but the finale, another in a long line of the many players gathered on one stage for a big showdown, conspicously lacks catharsis for the main character and lacks as a big action-packed set piece. “In Order of Disappearance” is that kind of action thriller that works better in the small moments rather than the big ones. There is a moment on a treacherous, empty road when Nils beats one of the thugs to a bloody pulp, trying to get information, but the thug won’t talk. Nils, however, is tired out, breathing heavily, and has to lay down next to his soon-to-be victim, in the shadow of the snowplow. They both begin to laugh. It’s the old Belly Laughs Before The Guy Gets Shot In The Face routine, sure, but it’s not the payoff that’s so enjoyable; it’s the set-up.